Automobile accidents are a pain. They can be costly, time-consuming, and in some cases, can involve a lawsuit if there are others involved. But congratulations! Being a smart, law-abiding citizen, you’re insured! Which is not only a good idea, it’s also required—as it is illegal to drive without insurance (or some proof of financial responsibility) in all 50 US states. Here’s a guide of what to do the moment you’re in an accident (assuming you’re already safe and no one is injured). It might sound crass, but be careful in your wording. If it’s not your fault, avoid terms like “I’m sorry,” or anything that could impute guilt. If it is your fault, be an upstanding citizen and take responsibility. Your insurance will likely still cover you (as long as you didn’t break their terms, ex. by drinking and driving or driving on a suspended license). Exchange identification, contact information, and insurance information. If the other party is belligerent or uncooperative, call the police to mediate the discussion and file an accident report. It always helps to have a third party able and willing to testify in the event your story is contested by the other party involved. Their recollection of the event, which hopefully matches yours, can help substantially in court. Be sure to also keep your story straight with extreme detail, as a strong memory of the incident and day will assist in your credibility and help your insurance company protect you as best they can. Take as many pictures as possible of the damage to all vehicles. 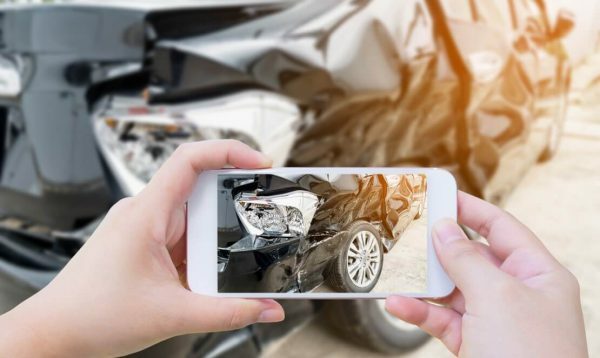 Not only can this help in any legal matters, it’s commonly used by insurance companies that use apps to submit damage claims! This will help you evaluate if insurance is needed in the first place. In a typical insurance claim, the policy holder is required to file a claim with insurance, pay their co-pay (their minimum amount to be covered), and insurance will cover the rest of the cost in damages. However, if the accident is small enough (ex, a small dent or scratch that costs less than your co-pay), it might be cheaper to pay for the repair out of pocket rather than go through your insurance and pay your co-pay. The way you interact with your insurance, the coverage they give you, and the time limit you must file the claim varies between insurance companies and depends on the severity of the accident. In California, if someone is killed, injured, or property damage exceeds $1,000, you must report the accident within 10 days to the DMV (filing with your insurance will typically guide you in this process). However, as a general rule of thumb, it’s best to speak to them immediately. There’s no set time limit on how long you have to file a claim, but an insurance company might decide not to cover you if you don’t act in good faith to promptly report an accident. As stated before, some companies even use apps to file claims. Others have you speak on the phone to a specialist and send them photos, some simply have you take the vehicle in to a body shop to get an estimate first, some will send a specialist to inspect the vehicle in person. Depending on your coverage and the severity of the accident, they might also arrange towing service and get you a rental car. Your insurance will guide you through the process of getting your vehicle repaired, which typically involves them providing you a list of repair shops in your area that are in their coverage network. As stated before, in a typical situation, you pay your insurance co-pay and the insurance company will cover the rest of the cost in damages.